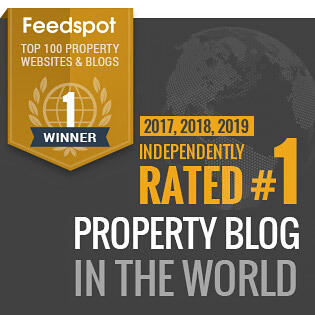 The pace of declining property values has eased relative to the past four months, however, the market downturn has become geographically more widespread, with housing values lower across six of the eight capitals and five of the seven ‘rest of state’ markets over the month. Although the CoreLogic national hedonic index series trended lower in March, the actual rate of decline has been easing over the past three months. In fact, the 0.6% drop in March was actually the smallest of the month-on-month declines since values fell by 0.5% in October last year. National dwelling values have been trending lower for seventeen months and have fallen by a cumulative 7.4% since peaking in October 2017. Despite the broad based weakness, the national index remains 15.9% higher relative to five years ago, highlighting that most property owners remain in a strong equity position. 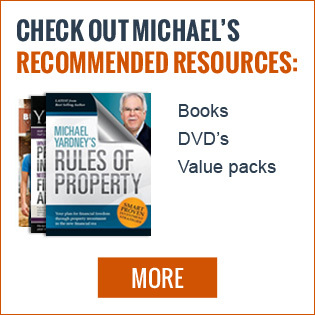 Markets where values peaked much earlier have shown a more substantial downturn. 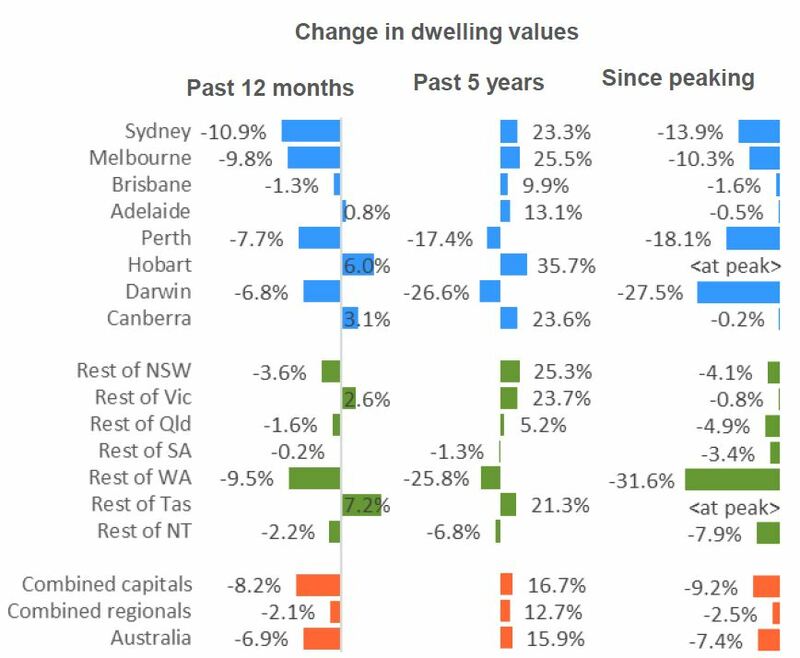 In Darwin and Perth, where weak housing market conditions were driven by post mining boom weaker economic and demographic conditions, dwelling values have fallen by a cumulative 27.5% and 18.1% respectively since peaking in 2014. The silver lining here is that housing is now very affordable and first home buyers are proportionally much more active relative to other areas of the country. On the other hand, dwelling values remain at record highs across Hobart and regional Tasmania, and only marginally lower in Canberra (-0.2%), Adelaide (-0.5%) and Brisbane (-1.6%), as well as regional Victoria (-0.8%). 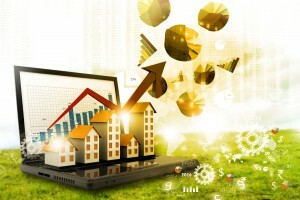 Although housing market conditions remain relatively healthy in these regions, conditions have noticeably softened over the past twelve month with values either slipping or the pace of growth slowing materially. Across the broad valuation cohorts, we are continuing to see the most expensive quarter of the housing market in Melbourne (-13.9%) and Sydney (-11.9%) record the largest annual declines, while most other cities are recording less variance between the upper and lower quartiles of the market. 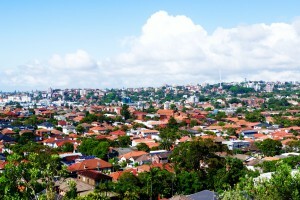 The difference in performance across Sydney and Melbourne’s high and low quartiles is likely related to several factors including affordability challenges and a surge in first home buyers funneling demand towards the more affordable range of properties, as well as more cautious lending policies for borrowers with high debt levels relative to incomes. Despite Sydney and Melbourne housing values falling, overall dwelling values relative to household incomes remain substantially higher than other cities, which could be another factor in skewing credit availability towards the middle to lower end of the market. With housing affordability becoming more challenging for Hobart, the lower quartile is showing a substantially stronger performance while cities such as Perth and Darwin, where the ratio of incomes to dwelling values is generally low, are showing a stronger performance across the top quartile of the market. 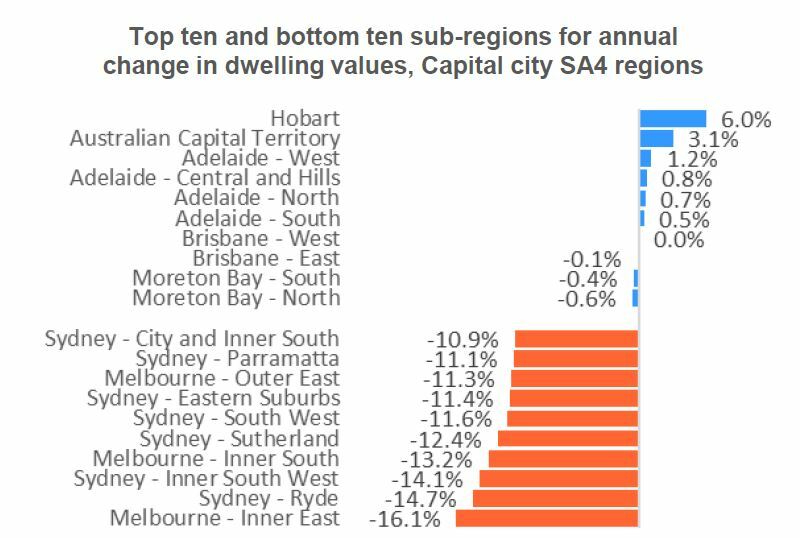 Across the 46 capital city SA4 sub-regions, only seven areas have avoided a fall in dwelling values over the past twelve months. 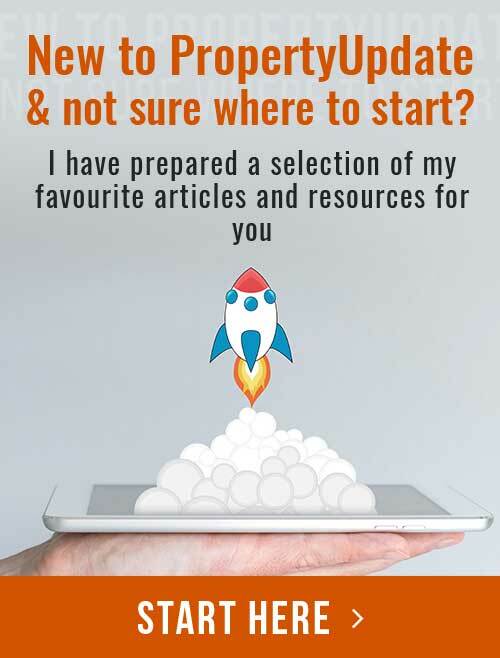 These positive growth areas include the metro areas of Hobart and Canberra, as well as regions of Brisbane and Adelaide. 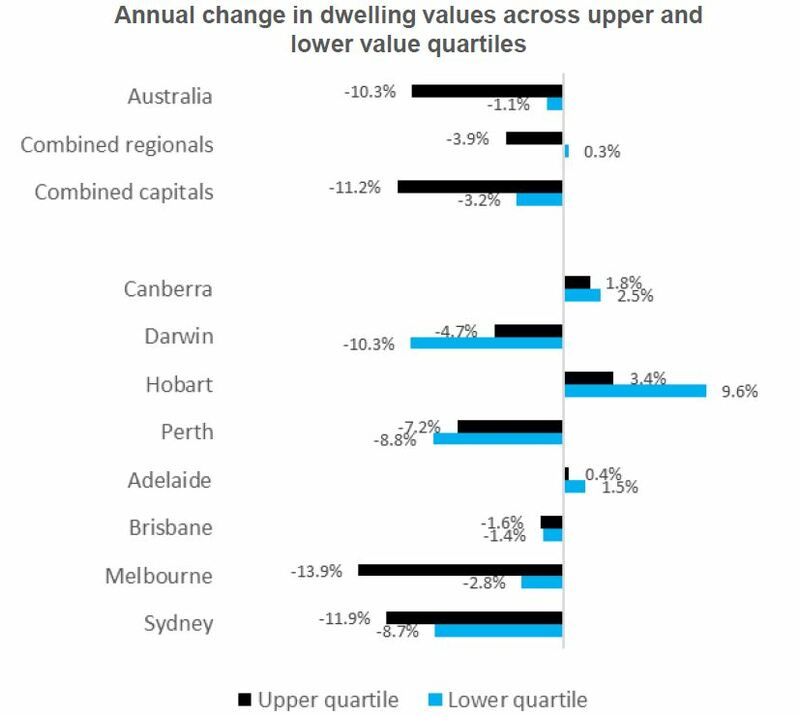 The smaller number of capital city regions recording any level of growth in dwelling values highlights the broader geographical scope of this downturn. At the same time a year ago there were thirty SA4 capital city sub-regions recording annual growth. 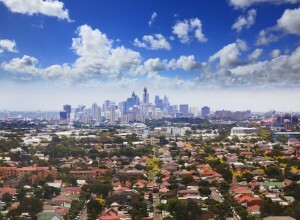 The weakest areas of the capital cities are now confined to Sydney and Melbourne, with some bias toward the more expensive areas of the cities. 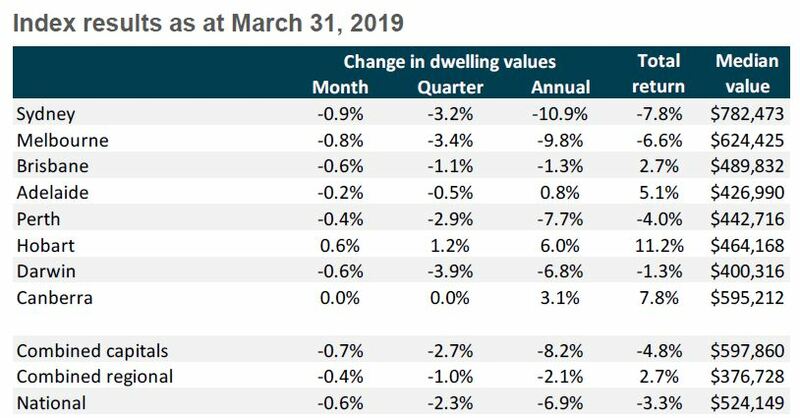 Melbourne’s prestigious Inner East has recorded the largest decline in values over the past twelve months (-16.1%) followed by Sydney’s Ryde (-14.7%) and Sydney’s Inner South West (-14.1%). 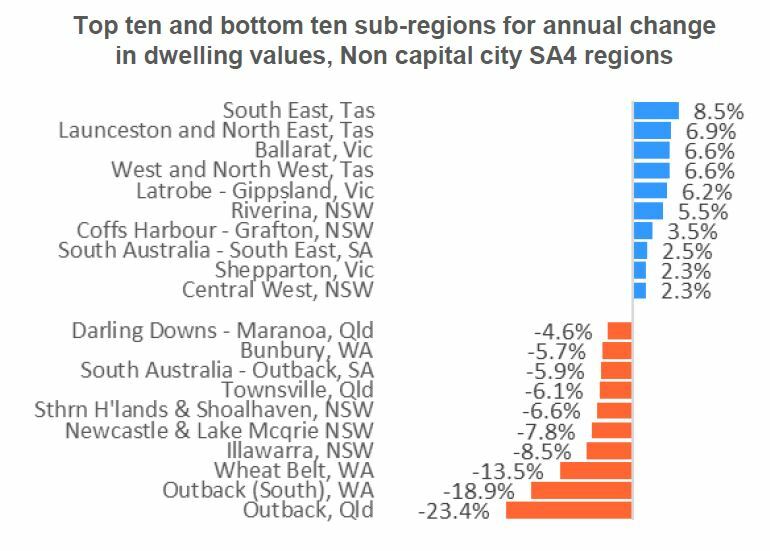 Across the 42 regional SA4 sub-regions, 18 regions are recording positive annual growth in dwelling values, demonstrating healthier conditions relative to the capital cities. Areas of regional Tasmania topped the list of best performers, with the strongest housing market conditions rippling away from Hobart towards the major regional centres of the state where housing values are generally more affordable. Regional areas adjacent to Melbourne are also continuing to show healthy market conditions, with Ballarat values 6.6% higher over the year and Latrobe-Gippsland values rising 6.2%. 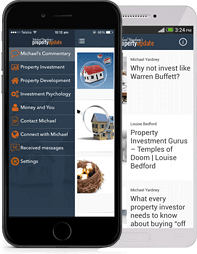 Lifestyle markets are generally still seeing positive growth conditions as well. The weakest performers across the regional markets tend to be a combination of agricultural regions, as well as the areas adjacent to the Sydney metropolitan region where market conditions are showing a similar trend to Sydney’s downturn, albeit with a slight lag. 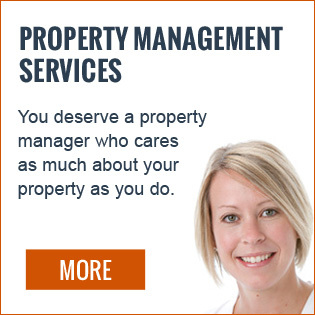 Capital city rents slipped 0.1% lower over the Gross rental yields twelve months ending March 2019; the first negative reading since at least May 2005 (which is the commencement date of the CoreLogic rental series). The negative change in annual rental activity was heavily influenced by the Sydney market, where weekly rents were down 3.1% over the year. Every other capital city apart from Darwin has recorded a modest rise in weekly rents over the year. Regional areas adjacent to Melbourne are also continuing to show healthy market conditions, with Ballarat values 6.6% higher over the year and Latrobe-Gippsland values rising 6.2%. 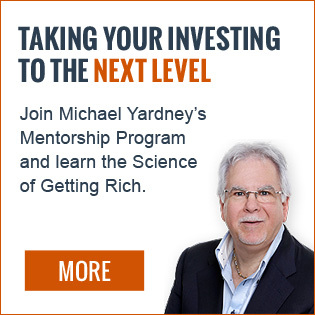 Lifestyle markets are generally still seeing positive growth conditions as well. 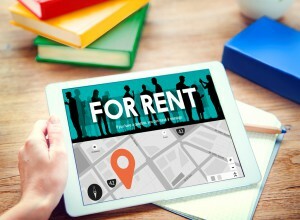 Sluggish rental conditions are likely the result of higher rental supply coupled with a reduction in rental demand. 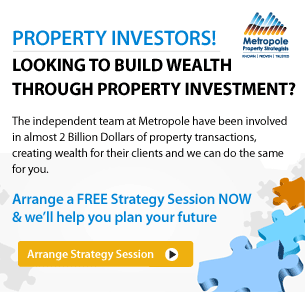 Higher supply can be attributed to the surge in investment activity over recent years, while the reduction in demand is the result of more renters converting to first home buyers. Despite sluggish rental conditions, gross rental yields are generally trending higher as rental rates outperform dwelling values. Gross rental yields have moved off their record lows in Sydney and Melbourne, however, these cities are still recording the lowest gross rental yields amongst the capital cities at 3.5% and 3.6% respectively. 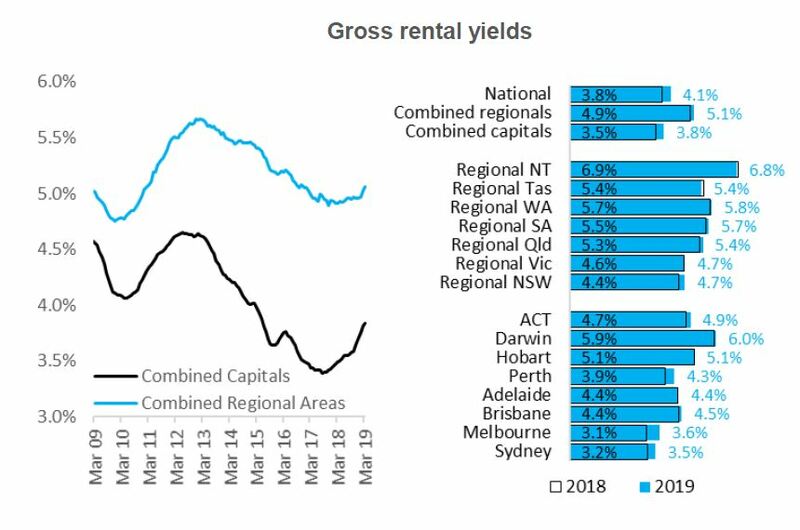 Most other capital cities are recording gross rental yields around the mid 4% range, with Darwin and Hobart showing a higher yield profile. Regional markets are generally showing a higher gross rental yield relative to the capital cities which is a long standing trend. 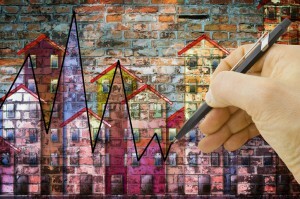 The housing market has recently shown some tentative signs that the downturn in dwelling values is losing some steam. Although this is a positive development, the outlook for the housing market will continue to be affected by uncertainty related to the federal election, lending policies and more broadly, domestic economic conditions. 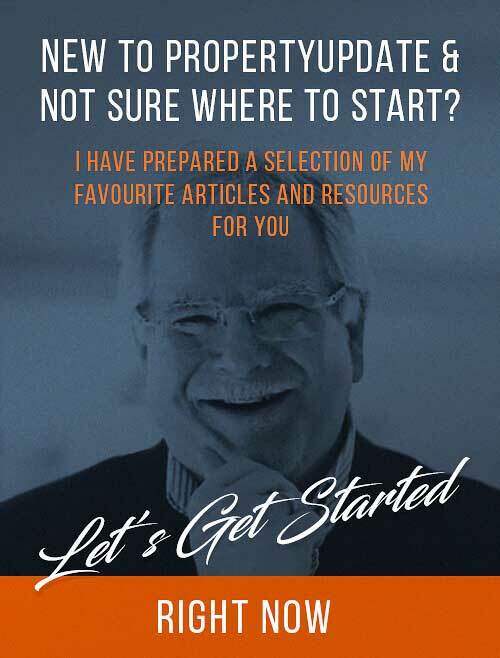 Federal elections generally cause some uncertainty, which is likely amplified more so this time around considering the potential for a change of government which will also involve significant changes to taxation policies related to investment. 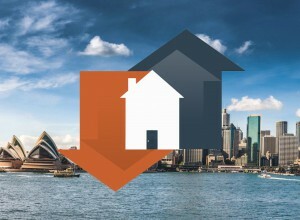 No doubt, some prospective buyers and sellers are delaying their housing decisions until after the election, however, there is no guarantee that certainty will improve post-election, considering the impact of a wind back to negative gearing and halving of the capital gains tax concession is largely unknown. 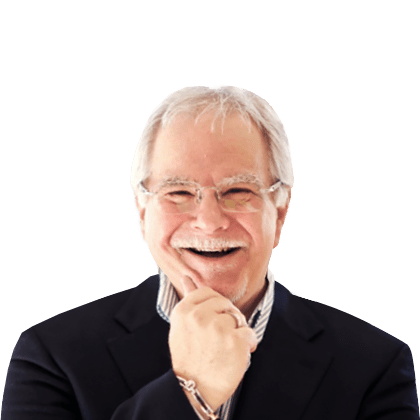 It seems a reasonable assumption that removing an incentive from the market would result in some downwards pressure on activity and prices for a period of time. 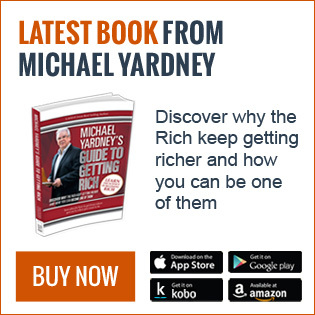 If elected, the Opposition have flagged that changes to the capital gains tax discount and negative gearing would take effect from January 2020. 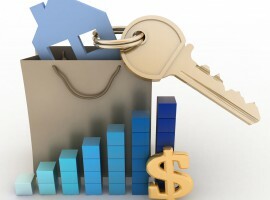 Another key factor cited by CoreLogic and one to watch in relation to the housing market will be credit availability. CoreLogic data tracking the number of housing valuation events, which provides a timely proxy for mortgage activity, has remained around 14% below activity a year ago. 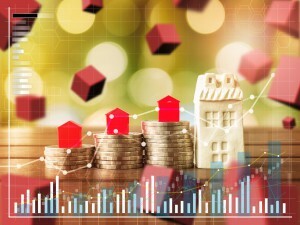 A similar trend is confirmed within the less timely ABS housing finance data which continued to show a reduction in both investor and owner occupier lending through to the end of January. While this trend in weaker housing finance commitments is very much entrenched for investment lending, the concern to the sharp downturn in owner occupier lending. The value of owner occupier lending is around 2.6 times the value of investor lending, so the substantial drop in owner occupier mortgage commitments perhaps explains why the housing downturn is becoming more widespread. The value of owner occupier housing finance commitments (excluding refi) was down 17.1% compared with January last year and investment credit was 24.6% lower. While there are headwinds for the housing market, other factors are likely to help offset the weakness such as a high likelihood that the cash rate will be cut later this year, which may result in lower mortgage rates. 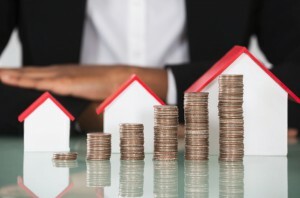 While any cuts to the cash rate may not be passed on in full, a lower cost of debt will provide some positive stimulus for the housing market. 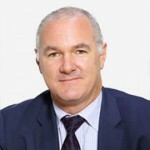 Arguably, this stimulus won’t be as effective as previous interest rate cuts due to the high serviceability buffer applied to borrowers, whereby lenders are still required to assess serviceability at a mortgage rate of at least 7% despite mortgage rates which are now available around the 4% mark or even lower. 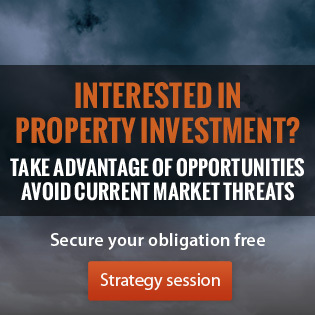 Improving housing affordability could be the silver-lining to this downturn. As dwelling prices trend lower or level out, household incomes are edging higher and mortgage rates remain around the lowest level since the 1960’s. First home buyers are clearly taking advantage of the improved levels of affordability and less competition in the market.